If you haven't already, you need to read last week's column as a preface to this one. My recent discovery of Jim Carroll and his talents led me to purchase Pools of Mercury, a combination spoken word and music CD released on Mercury Records in the fall of last year. The record was released concurrently with Jim's book of poetry Void of Course. (Both can be purchased on Amazon.com among other locations.) Six of the CD's fifteen cuts are poems that appear in Void of Course. Four cuts are poems from Fear of Dreaming, a book released in 1993. The rest are songs with lyrics recently composed by Carroll. I find it odd that the adjectives I would use to describe this CD seem clich�d: haunting, dark, introspective, surreal. This recording is anything but a clich�. It is in fact unlike anything I have ever heard before -- a fascinating mix. Poems read by Carroll over sound effects, alternating with his songs -- harshly seductive melodies and rhythms backing his grinding and powerful vocals. Pools of Mercury is one of those recordings that is itself a large work of art, not merely an anthology of several small works packaged together to sell. Each piece on this CD is like one of the teeth in your upper jaw -- each working together with the others to chew up your dinner. I have resisted reading Void of Course along with the recording. I want only to hear these poems while the CD is on and experience fully Jim's voice and his vocal inflections. Indeed the pieces take on so much more this way. When reading a book you are focused on the book and the sound is in the background. I want to focus on the sound. Musical pieces interspersed with spoken poems is something I have not seen done before -- at least not done effectively. Jim's singing is quite different from his reading. When he is reading he is exploring his soul. When he is singing he is reaching out and communicating allegories. The music composed for his songs by Anton Sanko and others is pulsating and moving. The sound textures composed for his spoken pieces are constant and without beat. These contrasts are like that of a stark black and white photograph. 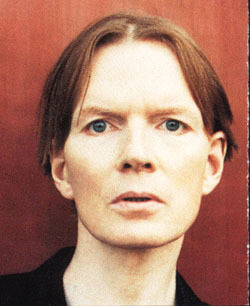 There is very little color in Jim Carroll's world. We like black and white photos because our brains do not have to process color information, thereby allowing us to see the essential meaning much more clearly and easily. This is why black and white photos can be much more disarming and affecting than color. Only rarely will someone describe a black and white image as "beautiful". Experiencing Jim's view this way, you see, without rosy shades, what churns at the core of his life. The emotion is raw and unfiltered. One song on Pools of Mercury is particularly "haunting" to me. Do you know how it ends if you won't let it begin? The original article was found here.